Happy summer sweet friends! Hope you’re having a lovely one (or a lovely winter if you’re experiencing it right now). Recipe experimentation has been on my agenda, and I’m happy to be able to share a new cut out cookie recipe with you – matcha sugar cookies! If you’re not familiar with it, according to Wikipedia, it’s a “finely ground powder of specially grown and processed green tea.” (More info. on Wikipedia, here). 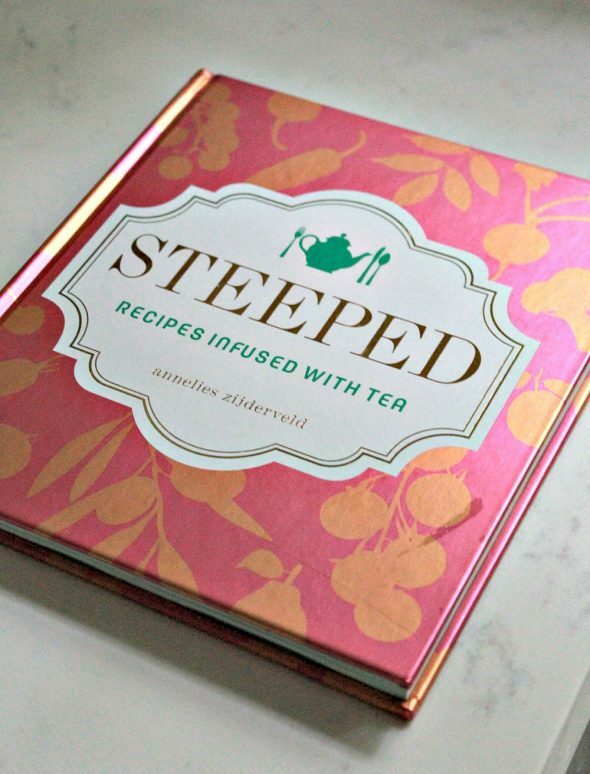 Besides putting it in my daily smoothies (there are a variety of health benefits), I have been wanting to try baking with it since I received a copy of Annelies Zijderveld’s book, Steeped: Recipes Infused with Tea. Annelies shares a Green Tea Sesame Shortbread Cookie, which I’ve since made and love. Among the many intriguing recipes in her book, I can’t wait to try the Mini Cherry Chai Cream Pies with Sweet Tea Glaze. But I digress… The Green Tea Sesame Shortbread Cookies are scrumptious and literally melt in your mouth, and like my vanilla shortbread cookie, are perfect back drops for decorated cookies, but not quite as sturdy as my sugar cookie recipe. 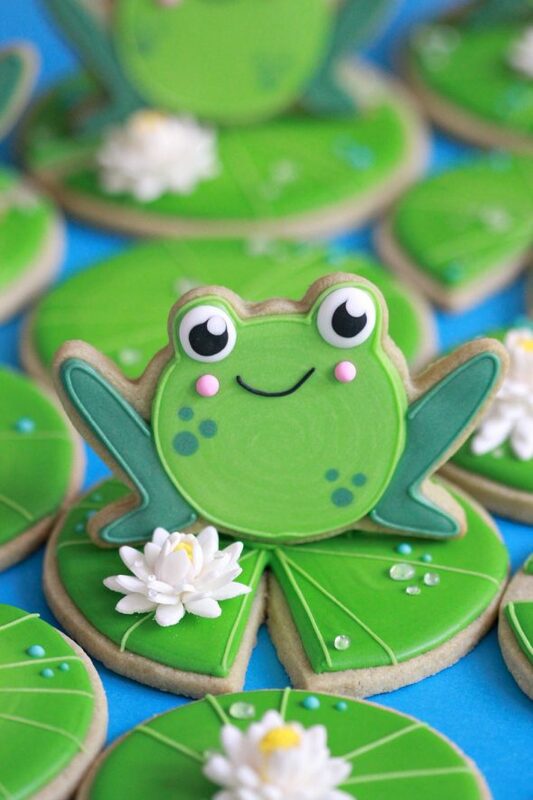 Because I wanted to try making lily pad cookies as a base for frog cookies, I knew I needed a stronger cookie. 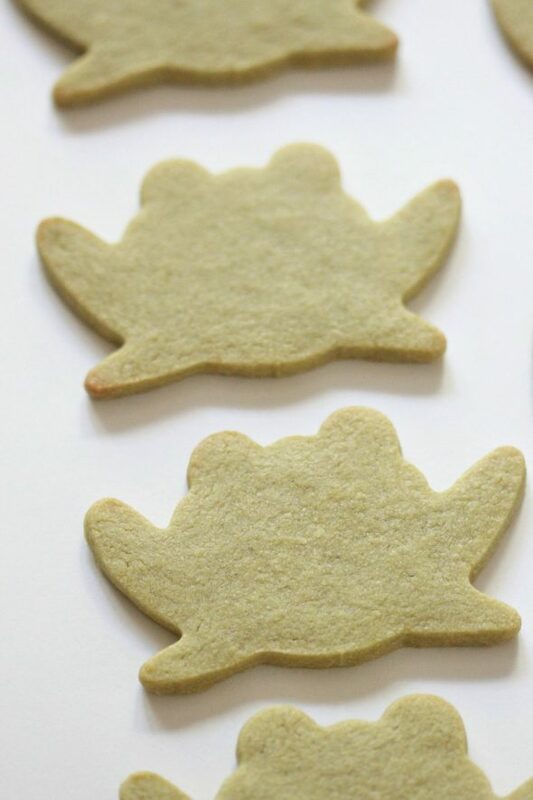 After some experimentation, I’m ready to share my version of Matcha Sugar Cookies. 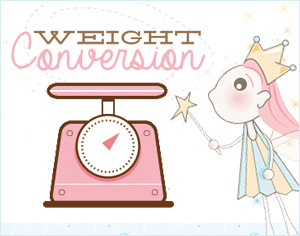 Thanks to Annelies for the inspiration! And a huge thanks to T by Daniel for sharing their premium quality matcha with me! You have got to check out this amazing tea shop… Their tea is available online and if you’re near the greater Toronto area, it’s on Main Street in Brampton. Flavours like Guavalicious, Vanilla Coco Loco, Mr. Fuzzy Peach and Strawberry Champagne, and I’m super excited to soon be baking with their Apple Strudel tea… yes, apple strudel tea! You can browse all the flavours here if you’d like to check them out. 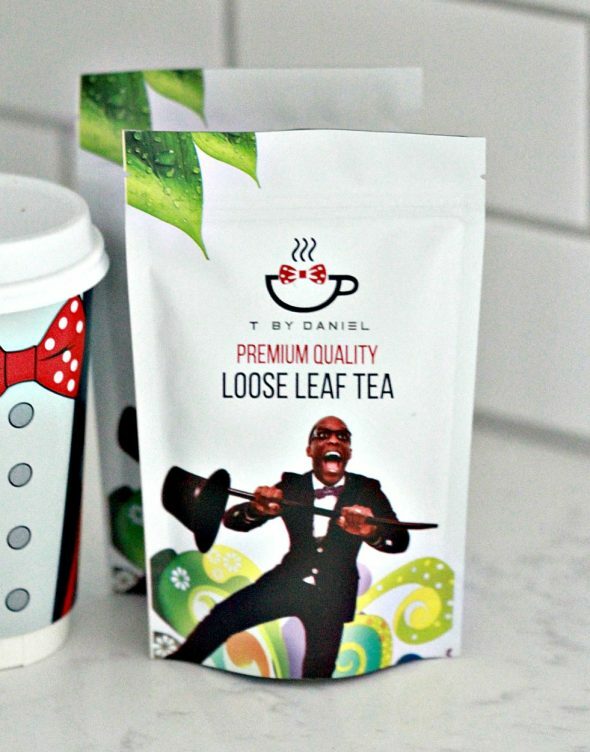 You can find the matcha I used from T by Daniel here. (Matcha Made in Heaven). 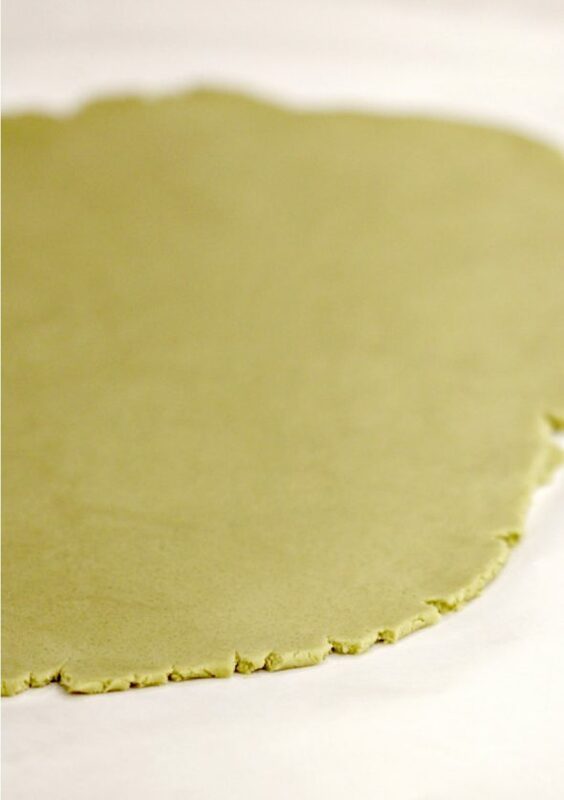 You’ll notice the dough has really taken on the green tea matcha color. 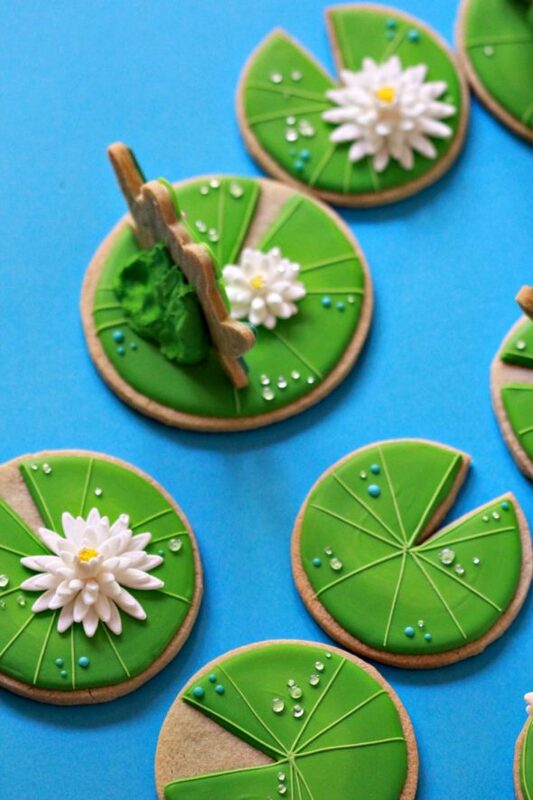 Once baked the cookies still retained their green look, and tasted so yummy! Add eggs slowly and mix. Add vanilla extract and mix. Scrape down the bowl with your spatula at least once and mix briefly again. Sift your dry ingredients together. (Flour, matcha powder and salt. I do not use baking powder in my sugar cookies). 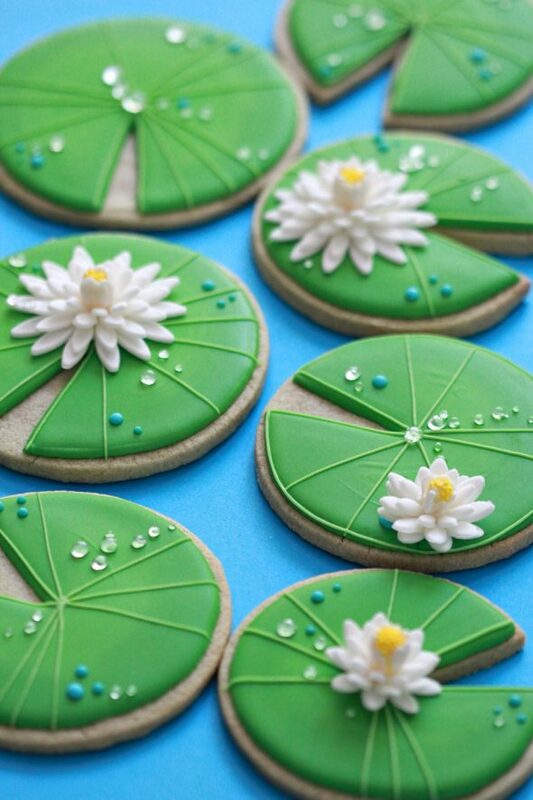 I used circle cookie cutters of various sizes for the lily pads, sometimes cutting a triangular shape wedge out with a paring knife. 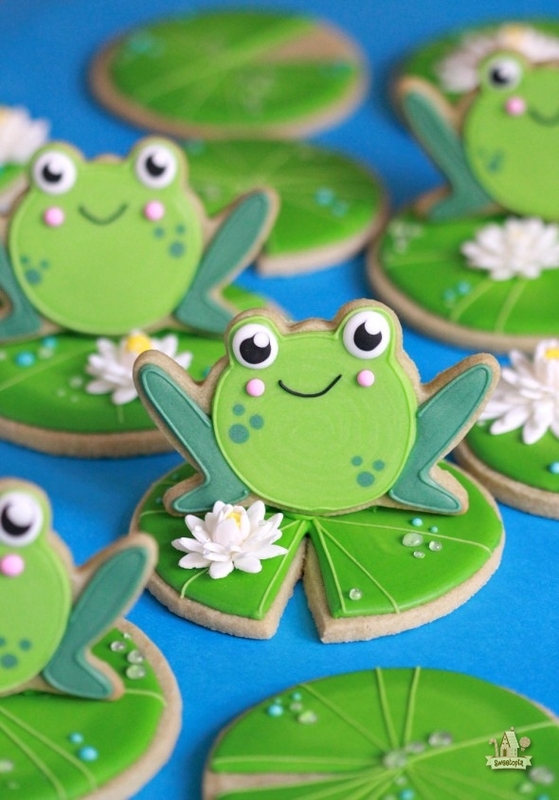 The frog cookie cutter is from How Sweet is That? 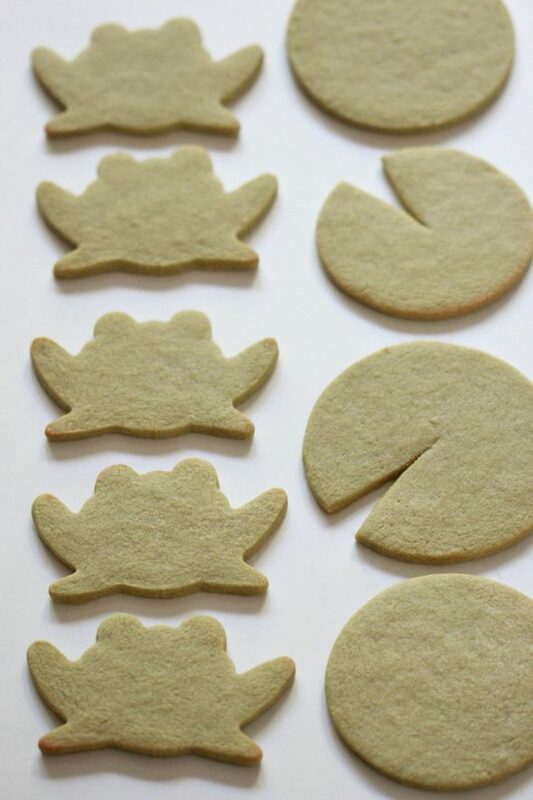 If you have some cookie decorating experience you’ll see that these cookies are simple in technique to make, so I won’t share a step by step process here. Please feel free to ask me any questions in the comment section. I sometimes also post videos on Instagram. (Click here if the video below doesn’t load). (Click here if the video above doesn’t load). A description on how to make candy or isomalt “water droplets” can be found here. 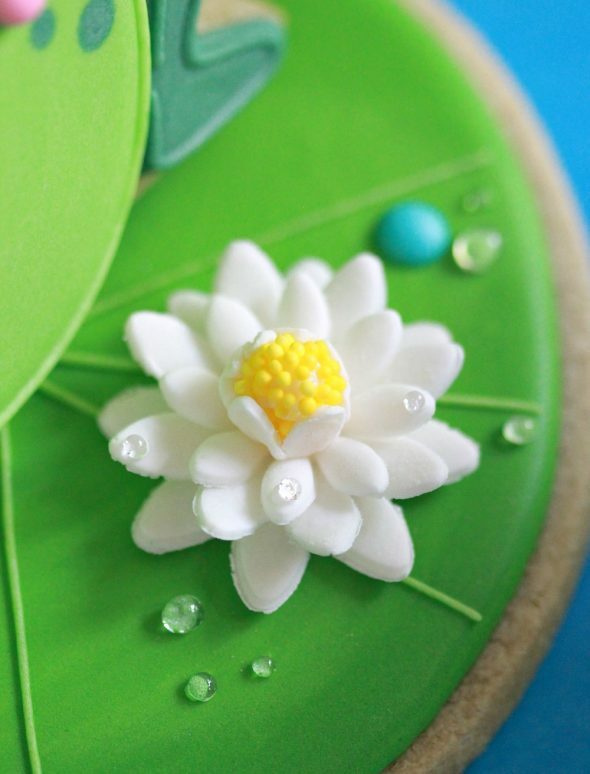 A video tutorial on making basic gumpaste or fondant flowers can be found here. For the water lily center, I rolled a small piece of gumpaste into a ball, wet it with water using a paintbrush (never used for paint), and rolled it in the yellow nonpareils. I placed the yellow ball in the center of a small, gumpaste daisy cut out, and wrapped the petals up the side of the ball. 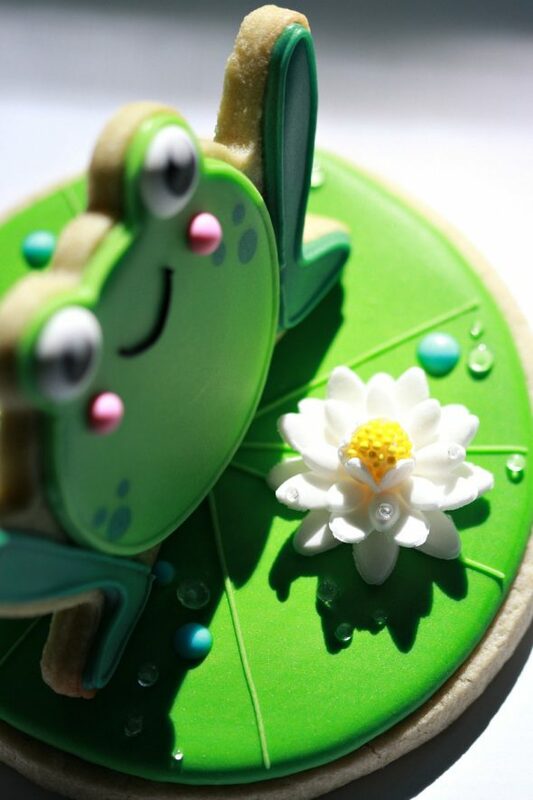 To make the frog cookie stand upright, I used thick royal icing and piped a great deal of it behind the frog, to prop him up. I pressed the icing into the back of the cookie using a spatuala and a ball tool (any tool would work for this). These were so fun to give away! I just made sure to note that I would recommend not eating the gumpaste flower (it dries quite hard). If you make yours with fondant you won’t need to be concerned about that. 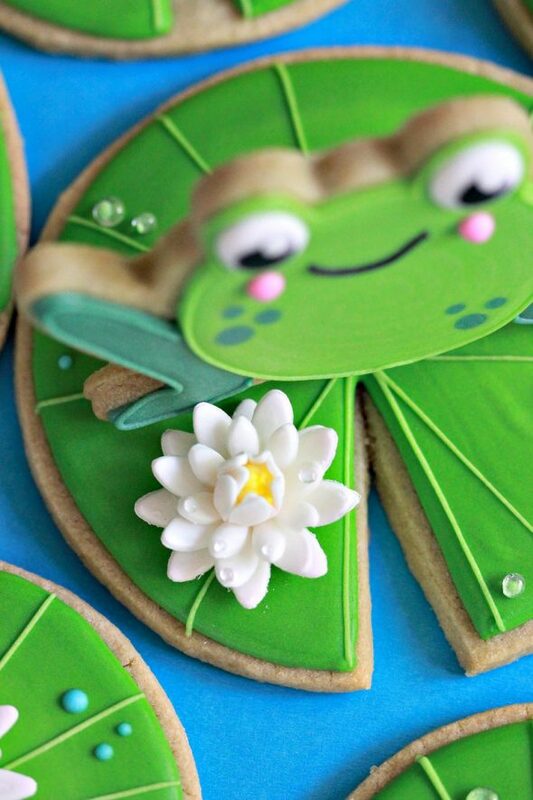 I also made sure to note the the icing holding up the frogs is quite hard… like a gingerbread house type icing instead of the icing on the frog and water lily surface. 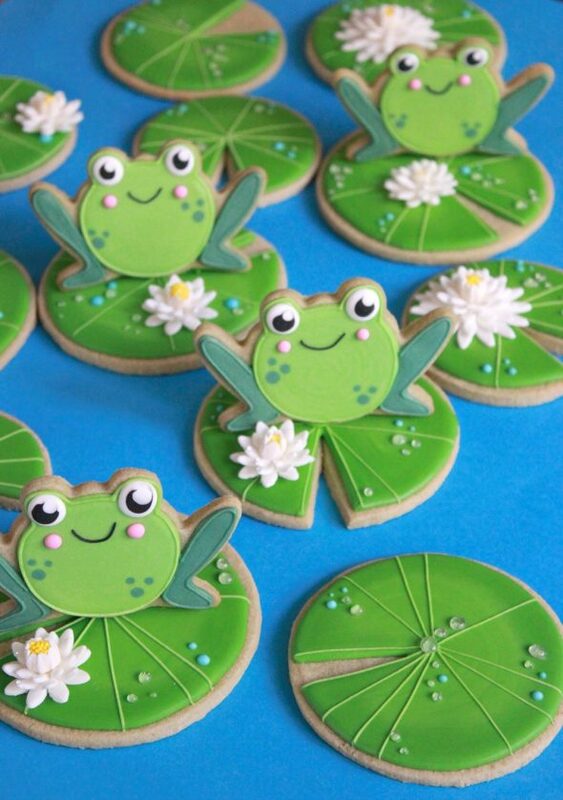 Those cookies, I can't even…They are A D O R A B L E!! 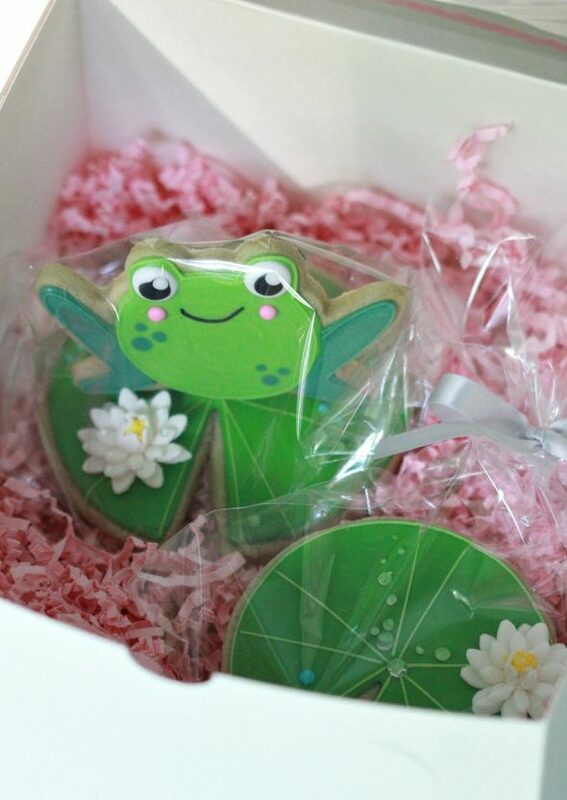 Hi Marian, Oh…..how beautiful are thies cookies. You are amazing me with every thing you create! I admire your talents. Have a great summer and may enjoy the real water lily on the lake. There maybe a frog near by!!!!! 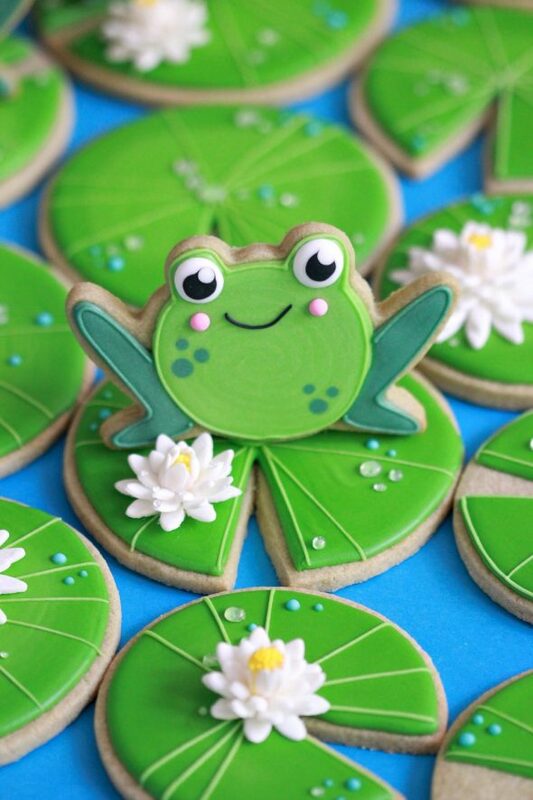 I love the water lily pads theme and you made it real so beautifully! 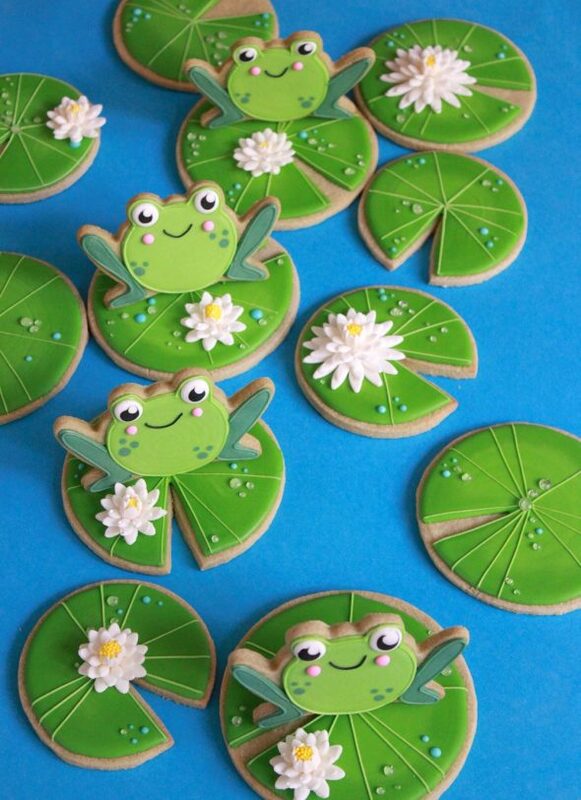 Wow, these frog cookies are absolutely beautiful! 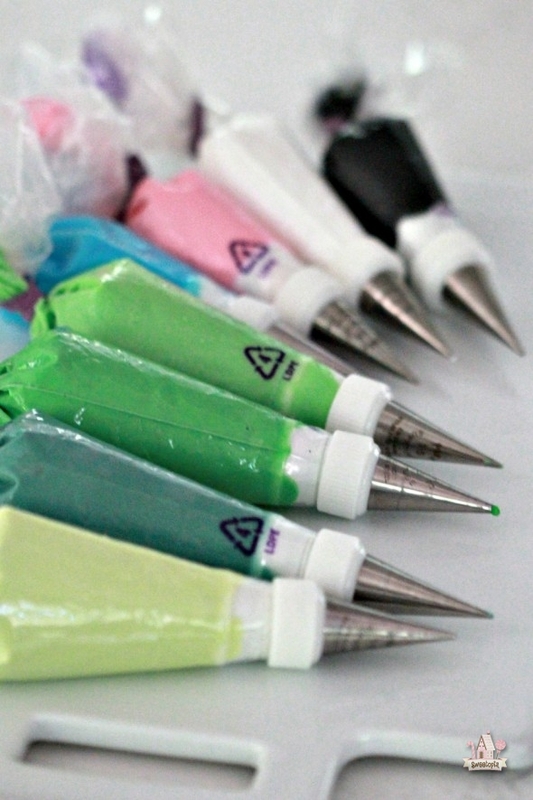 What flavor icing would compliment matcha? I used royal icing with vanilla.